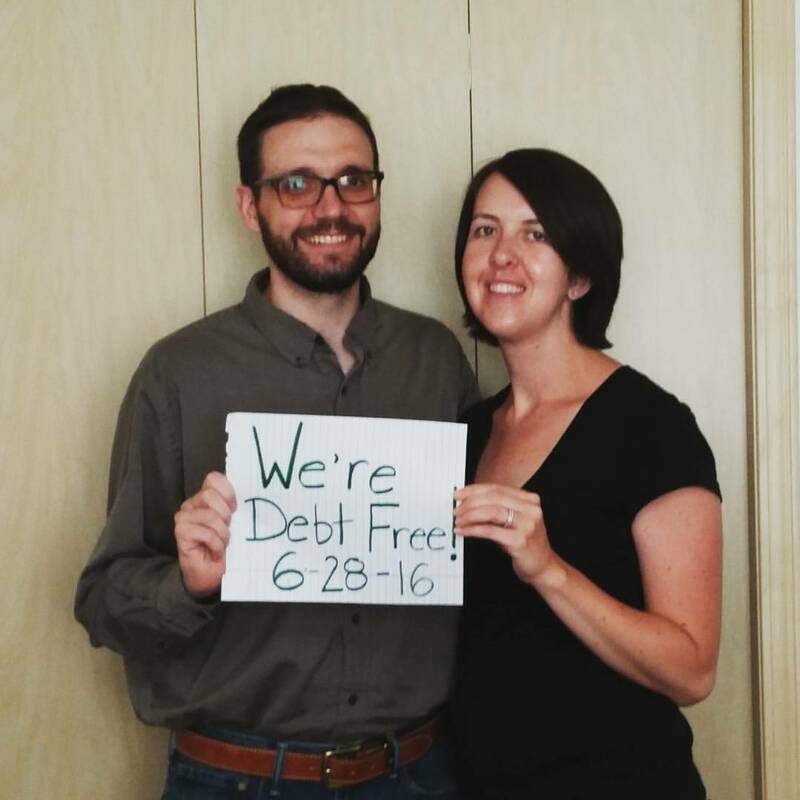 Our path to debt freedom was a long and windy one but we finally made it June 28, 2016! We are completely debt free except our mortgage! How'd we get here? Nate and I both grew up with similar backgrounds. We weren't poor, we always had food on the table, and a roof over our heads but we weren't wealthy growing up either. Our parents didn't travel a lot. I got a few new clothes when school started and at birthdays and Christmas but our parents couldn't afford expensive or fancy things. Both Nate and I got married young and had kids young. Both of us knew if we wanted to go to college we'd be paying for it ourselves. I don't remember being specifically taught about money as a kid. As a young adult and as a single mother I bought into American way of instant gratification. I can put it on the credit card and pay for it later. I can finance the new car because I need something reliable. I can rack up thousands of dollars in student loans because I am going to go to law school and make good money and it will be easy to pay off the loans. How else I am going to get a better job or get ahead or ever be able not to struggle financially if I don't go to college? Instant gratification is a terrible American cultural lie. You do not need what you want, when you want it! You can save for it, work hard, work a 2nd job, buy 2nd hand, or wait. It won't kill you, I promise. A lot of the credit card debt I racked up was as a single mom on monthly budget shortfalls from having too high of living expenses for the income I was bringing in. I didn't live a lavish lifestyle but I could have made better choices. Reduce grocery cost, buy a used car, find a cheaper apartment. The thing was at the time I didn't want to. I justified all these as necessary things at the time. I had to live in a safe neighborhood as a single mom. I had to have a reliable car that didn't break down. Both are true but there is a middle ground. After owning 2 used cars that were horrible and broke down non-stop I decided to lease a new Honda Accord. Piling money into used cars wasn't something I could afford but I also couldn't afford a lease. Leasing a car is a horrible financial decision as you take on all the immediate depreciation of a new car but technically don't own the car in the end. I ended up buying out my lease with a used car loan and drove that car 8 years until I was pregnant with my 4th child and we couldn't all fit in a 5 seat vehicle. It was a great car and I got good trade in value when I traded it for my van but I don't even want to know how much I paid in interest and how much lost value I took on by leasing it. Student loans, the golden ticket to success in America! No way! Nate and I both bought into the lie that the only way to get ahead was through a college degree. While I enjoyed my time in college and I am proud that I graduated with my Bachelors degree there are ways to do it without going into debt. Even 9 years after graduating from college I don't make that much more than I did at the bank without a college degree. Nate has an engineering degree and has seen huge jumps in his salary because of his degree. He almost doubled his salary out of college and over the past 8 years has almost doubled it again. Having a degree for him has paid off but he could have gotten a degree slower without going into debt. That is what I wish I did, continued to go to college part-time and cash flow my degree. If I get one point across do not take out student loans! I repeat do not take out student loans. They will haunt you forever. There may not seem like there is another way but there are other ways, scholarships, work study, full time work and part-time college. When we started attacking our debt we had $128,000 in debt! Staggering amount for two young adults with minimal income and 3 kids. Our debt broke down into $28,000 (half Nate's, half Michelle's) in credit cards, $20,000 ($10,000 left on two car loans both bought new), $80,000 student loans ($35,000 Michelle, $40,000 Nate). It was utterly overwhelming! In Part 2: I'll fill you in on what we decided to do about it.